How to manifest YOUR dream life this year! Do you have dreams and wishes that you would like to manifest for yourself this year? What does YOUR dream life look like? How does it feel? An amazing dream life doesn’t just happen by chance. 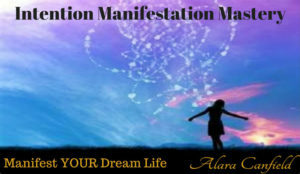 If you would like to manifest YOUR dream life this year, you can make it happen! You need to have a clear vision of it, dream about it, map it out, plan it and create it. Dream big, dream small, just dream and create your new reality! So, why is it important to create, write down, and review your goals, resolutions, and intentions? 80% of people do not even think about an intention, and only 1% write them down and review them. They actually achieve their goals and make their dreams come true. A goal, intention, and resolution without a plan is just a wish, have all of your wishes come true for you in the past? It is important to spend time dreaming of your vision for your ideal life, let go of what didn’t work in the past, have support to help you manifest your intentions, goals and resolutions, and review them regularly so that you can take action and bring them into the world with ease and grace. The Intention Manifestation Mastery program will guide you through doing that. You don’t want to miss this program at the crazy introductory price of just $44. The price for this live program will never be this low again! During the live 4 weekly calls, you can ask your questions, and work with me one-on-one to clear those stubborn blocks and limitations that have been holding you back from truly living your dreams. You will also receive 4 energized pdfs with practical information and clearings to continue the healing and clearing process. Also, you will receive not only the mp3 recording of the live calls, you will also receive 4 weekly mp3s filled with activations and infusions that you can listen to in order to go deeper into the healing process. And, last but not least, you will receive 4 weeks of remote energetic healing transmission to support you during the program. Some of the results you should get from participating in this program include more dreams and goals achieved, increased self-confidence, purpose, direction and motivation, your bucket list being ticked off, and more peace, ease, joy, and grace. So, start thinking of what you would like to create this year, write down your goals, resolutions, and intentions and get ready to manifest them with ease and grace. I look forward to sharing this journey with you and more importantly I look forward to hearing your success stories from actualizing your amazing dream life! You can make your dreams a reality, you can live your dream life, you can prosper! Click Here to join me to manifest YOUR dream life! Set Intentions to Reach Your Targets! Is Now The Time To Set Your Intentions?